Asha Clark is one of seven UofL Upward Bound seniors to receive more than $100,000 in scholarships. 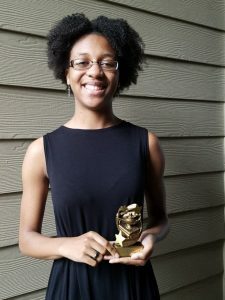 LOUISVILLE, Ky. (May 1, 2018)—Asha Clark and 30 other seniors from Jefferson County Public high schools stood proudly at the annual Upward Bound Academic Banquet as their names were called and their scholarship awards were recognized. Collectively, the group received more than $1.7 million dollars in scholarships and other aid from various colleges and universities. Clark was one of seven students who received more than $100,000. of Louisville’s Belknap Campus for more than 50 years, serves high school students from low-income and first-generation families. The goal of the Upward Bound Program is to increase the rate at which its participants enroll in and graduate from institutions of post-secondary education. The banquet was held at the Brown & Williamson Clubhouse and celebrated the seniors that participated in the program and recognized more than 90 of the participating 165 students in the program who attained a 3.0 GPA or higher. Dwayne Compton, associate dean for community engagement and diversity and the chief diversity officer for UofL’s School of Medicine, was the guest speaker for the evening. More information about the UofL’s Upward Bound program is available online.